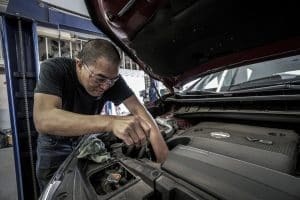 Regular maintenance is crucial to keeping your ride running smoothly, and doing it yourself is a great way to save money! Just like the human body needs water and nutrients to run smoothly, your vehicle needs to have its fluids topped off occasionally. Read on to learn which automotive fluids need to be replaced as part of your vehicle maintenance routine. Oil – Oil lubricates the engine and absorbs heat. Make sure to change it every 3,000 miles or 6 months, whichever comes first. Radiator Fluid – Radiator fluid prevents engines from overheating. Make sure to change it every 30,000 miles or 5 years. Transmission Fluid – If you’re experiencing trouble shifting gears, erratic shifting, or transmission surges, check the transmission fluid. It should be change every 30,000 to 60,000 miles. Power Steering Fluid – Is there whining or squealing when you turn the wheel? Then you might need to top off your power steering fluid. A drop in this fluid could also mean you have a leak in the power steering rack. Check it every couple years. Brake Fluid – Pressurized brake fluid helps your brakes work – if it’s low or has turned a dark color, then your brake fluid needs to be changed. Air Conditioner Coolant (also known as Refrigerant or Freon) – If you’ve ever survived a Georgia summer, you know this one is no joke! Keep it cool in your car by checking this fluid level twice a year – once before it heats up for summer, and once before the temperatures drop. Wiper Fluid – How often you need to check this depends on how much driving you do and how dirty your vehicle gets, but a good rule of thumb is to check it at every service interval (usually every 6 months or 3,000 miles). At U-Wrench-It, we’re happy to help thrifty DIY-ers find the right used auto parts for any project! Shop for car parts online, view our price list, or visit us during our regular business hours for in-person service.